FlyBoard Niagara promises the thrill of a lifetime with flights on the flyboard. It’s the only company to offer flyboarding near Niagara Falls. 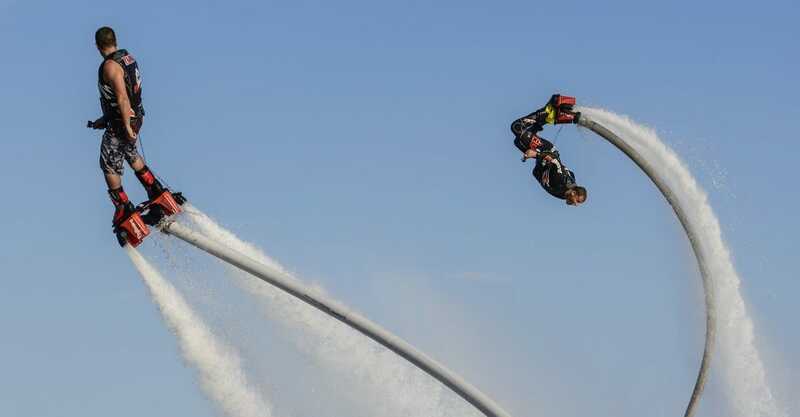 A flyboard is an apparatus connected to a water craft like a jet ski by a long hose. The flyboard rider stands inside the boots on the board of the apparatus in appropriate gear including a life jacket and helmet. Once the rider enters the water, the jet ski takes off slowly. Water is forced under pressure from the hose to the boots that have jet nozzles underneath them. As water rushes out with force through these nozzles, the rider is propelled into the air or into the water. It is both a thrilling and a fun experience to shoot high up in the air or jump in and out of the water. At FlyBoard Niagara, an experienced team of instructors helps you to get your basics right and train you to flyboard. It doesn’t take long, usually just a few minutes, as this sport is mostly about maintaining your balance. In that sense, it is similar to biking, water skiing, skating or surfing where once you get your balance right, you get the hang of the sport. And once you find your balance, you will be carrying out manoeuvres in the air and water in no time at all. A few falls into the water are normal as you learn the ropes but the safety equipment ensures that there are no problems. You can also dive in and out of the water like a dolphin once you understand how to turn left or right. The instructors are very patient, impart amazing training and monitor the flyboarders closely so that enthusiasts have a very safe experience. The FlyBoard apparatus is a buoyant device so you can even rest in the water for some time between flights if you are tired. Along with your head, the helmet covers your ears and protects it from discomfort when you fall into the water. Flyboarding is a great experience and if you wish to record your flight, wear a helmet cam and you can have the entire activity recorded dive by dive, flight by flight. Take a look into our Niagara Falls Hotel Packages, which feature valuable add-ons such as dining credits, wine tasting vouchers, casino slot play and more.